Ok - I know I said I'd only be posting on M-W-F... but since I've deviated from that already this week, here's a Saturday morning post for your enjoyment. Let's go waaaay back to the 70's and pick any random morning... maybe your mom is packing your lunch in your Snoopy lunch box before catching the bus to school... or perhaps you're up extra early on a Saturday morning so you won't miss the line up of Bugs Bunny, Road Runner, Superfriends and the other great cartoons that have seem to vanish from the networks - only to appear by demand on YouTube. 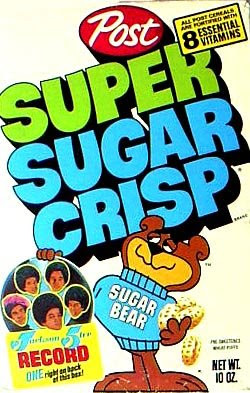 Regardless of what day it was or where you were, you likely had a bowl of sugary delight in front of you (part of a nutritious breakfast that Mom never seemed to serve). 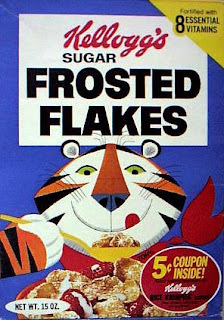 Below are just a few of my favorite kids' cereals - most of which you can still find in stores today. 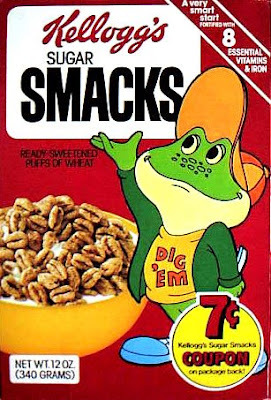 However, pay close attention, because these images are vintage cereal boxes - possibly the same designs you were admiring in front of you as you slurped away each morning. 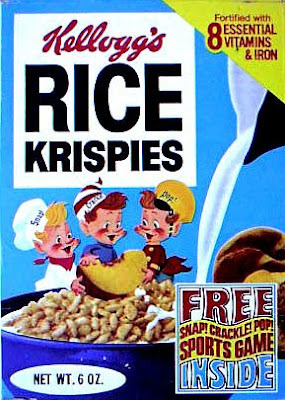 I always added a spoonful of sugar to my Rice Krispies. So what's the difference between these two anyways? cut out of the back of the box! The Leprechaun wins HANDS DOWN. 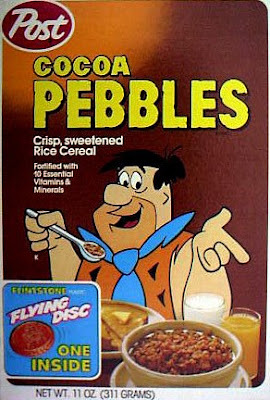 Cocoa Pebbles are my FAV! to get to eat one or two bowls. 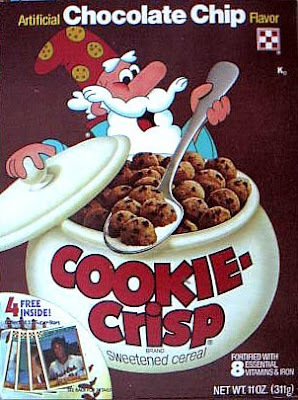 A bowl of chocolate chip cookies for breakfast? If you enjoy vintage food items, then visit Dan Goodsell's website - Tick Tock Toys - where you'll find goodies from the 70's and beyond. Most if not all the photos above are from Dan's collection. 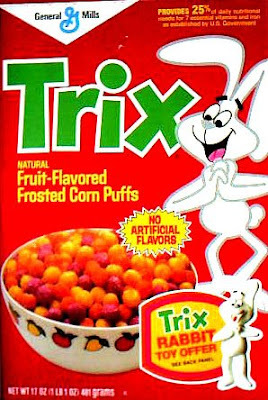 I havn't had Trix since the early 70's. 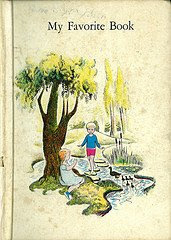 My son mentioned he liked it while staying with a friend, years ago, so I bought it yesterday. Why did you have to ruin it with the blue and red colors? Yuk. Tastes like Fruit Loops now, which I won't buy either. My son said last time he'd had it was when it was all different shapes. 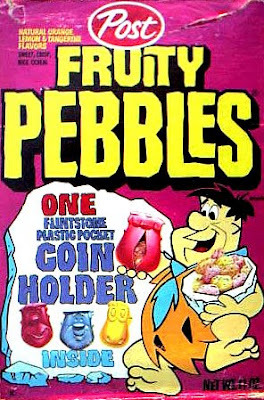 Did it not have as much 'blue and red' taste back then? He doesn't care for it either, now. 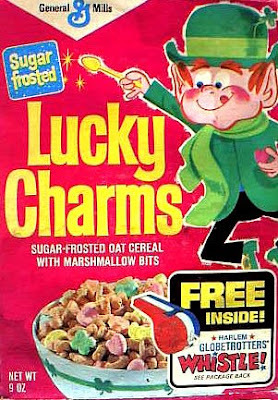 While I'm here, any chance you could put less marshmallows in the Lucky Charms? Way too sweet. Also, what are some of those shapes supposed to be? I'm sure if you tried to go back to pink hearts, yellow moons, orange stars and green clovers you would get just as many sales as each generation changes. Some type of promotion?